This easy classic pizzelle recipe produces light and crispy vanilla Italian waffle cookies using a pizzelle iron! 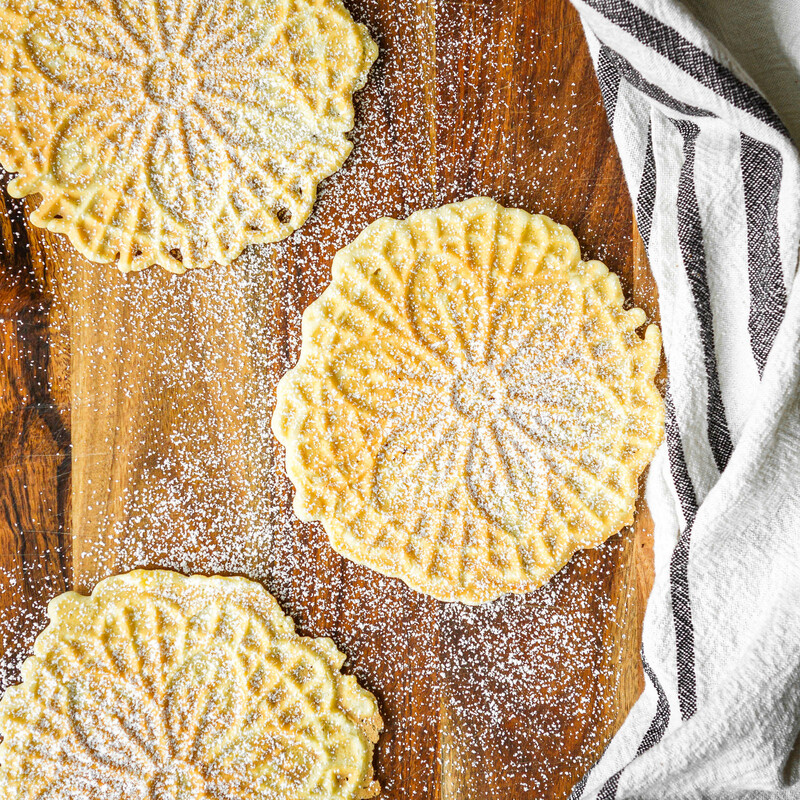 Includes tips for how to make pizzelles + variations for making traditional anise, almond, lemon, and chocolate pizzelle cookies. So here’s the thing — pizzelle cookies were never really on my radar until I got married. Oh, I’m sure I’d eaten them before, but I’d never made them. As a newlywed, my husband begged me for weeks to make pizzelles for Christmas. I kind of smiled and nodded and said I’d look into making them — you know, brushed him off, basically… I mean, I had no idea how to make them! Then one day he mentioned how his grandmother made them every single year for Christmas. How an Italian waffle cookie became a Polish family tradition is beyond me… But at that point, I knew I couldn’t keep putting him off. So I scoured the Internet for a pizzelle recipe (because, of course, he didn’t have his grandmother’s recipe), and using several different sites, created one that sounded like what he’d described. Only problem? We didn’t own a pizzelle iron. Traditionally, pizzelles were baked with a cast iron pizzelle iron over an open fire, a hot and tedious undertaking. 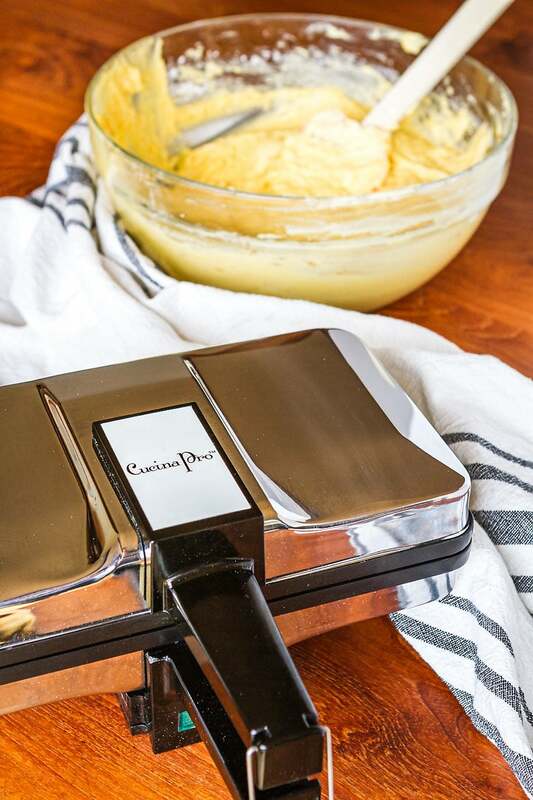 Thank goodness for modern conveniences — we can now purchase electric pizzelle irons that make baking pizzelles simple and easy. After a little research, I settled on this nonstick pizzelle maker. The price was slightly more than I was hoping to spend, but I’ve definitely gotten my money’s worth from it over the years… We only pull it out a couple times a year, but it’s still as shiny and pretty as ever! If you’re not a fan of the flavor of anise, a common spice in pizzelles that has a flavor akin to licorice (I am decidedly NOT), don’t worry. 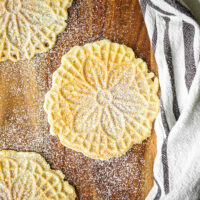 Pizzelles are wonderfully flexible when it comes to both flavoring and shaping them. Vanilla, chocolate, almond, citrus — these are all fabulous flavors to add. And warm pizzelles can be shaped into cones, bowls, cannoli, tacos, and more. I really need to start using my pizzelle iron more throughout the year! I opted to keep my pizzelle cookies very simple, just flavoring them with pure vanilla extract. Sometimes, I’ll change it up and use a vanilla bean paste — the flecks of vanilla bean are SO pretty. This recipe is also easily adapted into a chocolate pizzelle recipe, and my kids are always thrilled when I make chocolate pizzelles. Whatever flavor you fancy, when you’re making a recipe as simple as this, high-quality ingredients make all the difference — so choose the best you can afford! 1| Even if you’re using a nonstick pizzelle maker, you may still need to mist it lightly with oil before the first use. 2| Place your batter slightly behind the center of the mold because it will spread forward as you close the lid. I highly recommend this medium cookie scoop for measuring perfect portions and releasing the batter easily. 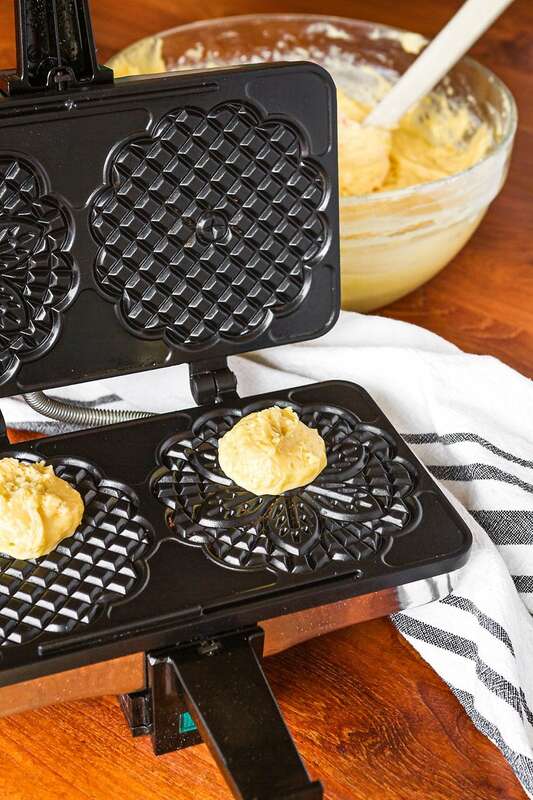 4| Have a cooling rack easily accessible next to the pizzelle maker. 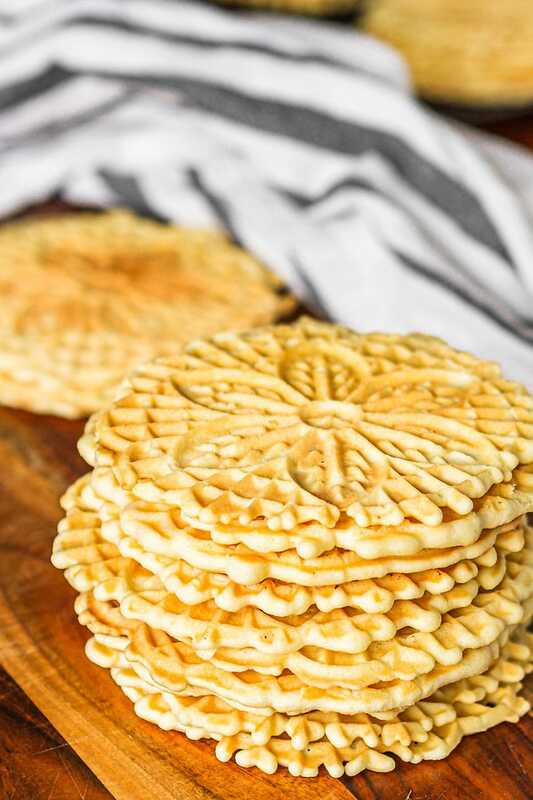 I’ve found that the best workflow for me is to use a wooden spatula to remove the cooked pizzelles from the maker to the cooling rack, start another batch of pizzelles cooking, and then move the cooled pizzelles to a stack to make room for the next round of fresh and hot ones. 5| The pizzelles will be very flexible when you remove them from the pizzelle iron, and then they will crisp up as they cool. I actually prefer them after they sit for about a day, but they don’t often last that long! If you want to mold your pizzelles into a different shape, do it while they’re still warm and flexible. 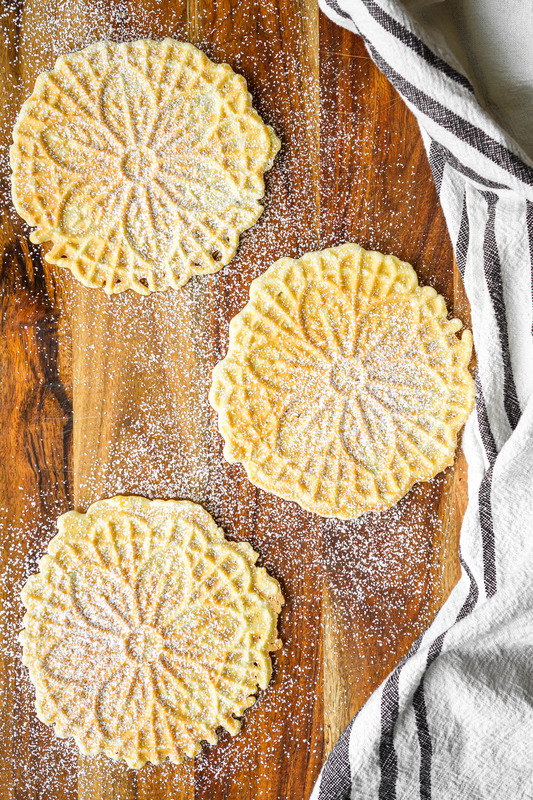 Over the years, making this classic pizzelle cookie recipe has become one of our family Christmas Eve traditions. My kids love to help by pulling the cooked pizzelles off the pizzelle iron, while I get another batch cooking. Then they stack the cooled pizzelles up before the next batch is ready. I’m hoping they continue it with their own kids someday! PIN IT NOW! CLICK HERE TO ADD THIS PIZZELLE RECIPE TO YOUR COOKIE RECIPES BOARD ON PINTEREST! Beat eggs and sugar in a mixing bowl approximately 2 to 3 minutes, until they're fluffy and a light yellow color. While still beating, slowly drizzle in the melted and cooled butter. Then add the vanilla extract. In a separate bowl, whisk the baking powder into the flour. Using a spatula, fold the dry ingredients into the wet ingredients until just incorporated. Bake one medium cookie scoop of batter (about 1 1/2 tablespoons) per mold in pizzelle maker until golden brown, about 30 seconds. Remove with a wooden spatula to a cooling rack. chocolate pizzelle recipe -- omit vanilla extract in recipe above, adding 3 tablespoons of quality unsweetened cocoa powder sifted and 3 tablespoons of granulated sugar. almond pizzelle recipe -- substitute 1 tablespoon pure almond extract for the vanilla extract in recipe above. lemon pizzelle recipe -- reduce the pure vanilla extract to 1 teaspoon, and add 2 teaspoons of finely grated lemon zest. traditional anise pizzelle recipe -- add 1/2 teaspoon anise seed to recipe above. — omit the vanilla extract in the recipe above, and add 3 tablespoons of quality unsweetened cocoa powder (sift after measuring), along with 3 additional tablespoons of granulated sugar. — substitute 1 tablespoon of pure almond extract for the vanilla extract in the recipe above. — reduce the pure vanilla extract to 1 teaspoon, and add 2 teaspoons of finely grated lemon zest. — add 1/2 teaspoon anise seed to recipe above. I’d love to see how your pizzelle cookies turn out… Tag me @Unsophisticook on Instagram or use the hashtag #Unsophisticook so I can check it out. Enjoy! My kids love this type of cookie but I always buy them. You make them look so easy and I like how versatile they are! I’m sure they are great with fruit and whipped cream! I wish I saw this recipe the other day to try. I have my grandmother’s Pizzelle Iron and made a ton of them…it would have been the perfect time to try your recipe. 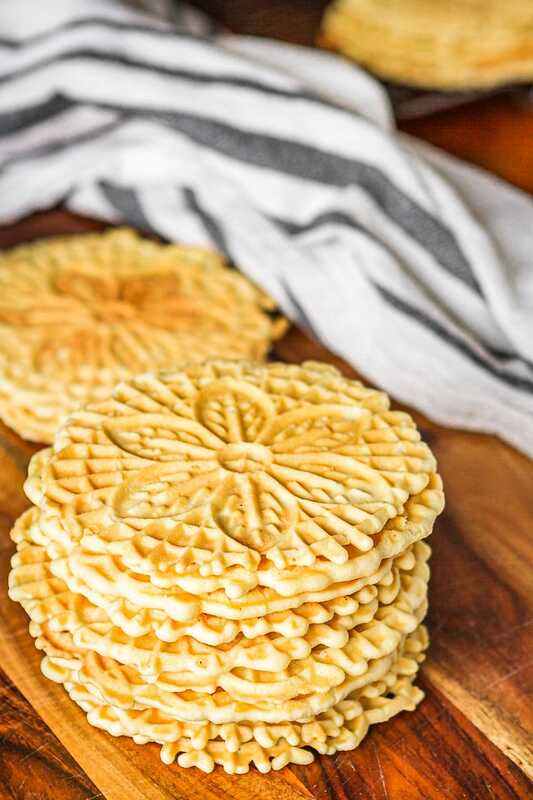 I love pizzelle, they are such a light cookie and lightly sweeten. I need to get me one of those waffle makers. My husband absolutely loves these pizzelle’s. They bring back his childhood Christmas memories! Every time I see them, I buy them but now I can make them myself. So much easier than I thought. Thank you for the recipe.